Santa Maria del Fiore - FLORENCE LIVE! The first episcopal church of Florence was the ancient basilica of Saint Lawrence 'outside the walls', consecrated by Saint Ambrose of Milan in 394. The next main church and cathedral was the Basilica of Santa Reparata, Martyr, which - as can be deduced from recent excavations - was built in the 5th or 6th century. When its rebuilding and enlargement were decreed, Boniface VIII's legate, Cardinal Valeriano, solemnly laid the first stone of the new cathedral on the Feast of Mary's Nativity, in 1296. In 1412 the new name of Santa Maria del Fiore (Our Lady of the Flower, or 'of Florence') was officially assigned to the magnificent church that by then had arisen on the remains of the earlier basilica. 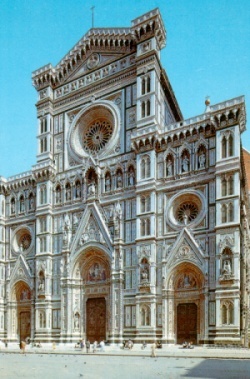 In 1420, Pope Martin V conferred the privileges of a metropolitan church, and Santa Maria del Fiore was finally consecrated on March 25, 1436, by Pope Eugenius IV. When the mosaic decoration of the Baptistery was nearly complete, in the last decades of the 13th century, the Florentine government decided to build a new cathedral. The old duomo, dedicated to Santa Reparata, was "crumbling with age", as a document of the time attests. Next to the now "lovely" Saint John's, moreover, Santa Reparata seemed "very crude", as Giovanni Villani, a 14th-century writer, tells us. And in that era of dramatic population growth, the old cathedral was "small in comparison to so great a city", according to Villani. Thus the dream of an enormous church, far bigger than the cathedrals of Pisa and Siena, the rival Tuscan cities, was born. Florence wanted her Duomo to be grander in size and in exterior adornment, "all in marble and with carved figures" (reliefs and statues), as Villani says. The Cathedral we see today is the result of 170 years of work. The first stone of the facade was laid on September 8, 1296, under the direction of Arnolfo di Cambio who, in the same period, oversaw the construction of Santa Croce and Palazzo delIa Signoria. 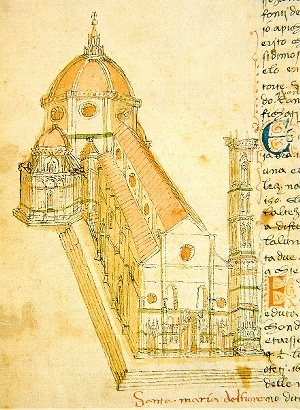 Arnolfo's design was subjected to numerous modifications, however: the most obvious are visible on the church's sides, where the first four windows are narrower and closer together than those toward the east, which are part of an enlargement of the plan due to Francesco Talenti in charge of construction after the mid-14th century. The radiating eastern chapels were finished in the early 1400s, and the gigantic dome designed by Filippo Brunelleschi was completed in just 16 years, from 1418 to 1434; "a structure so immense, so steeply rising toward the sky, that it covers all Tuscans with its shadow", as Leon Battista Alberti wrote at that time. The lantern, designed by Brunelleschi, was built after his death (1446), and the gilt copper ball and cross by Verrocchio, containing holy relics, were set in place in 1466. And like most of Europe's gothic cathedrals, the new Florence Duomo was dedicated to the Madonna, with the title "Saint Mary of the Flower", a courtly tribute to the Virgin's role in God's mysterious plan. According to a document of the early 15th century, the "flower" in question is in fact Christ, first fruit of our salvation, germinated on the 'stalk' (Mary) sprung from the 'root' of David's family. 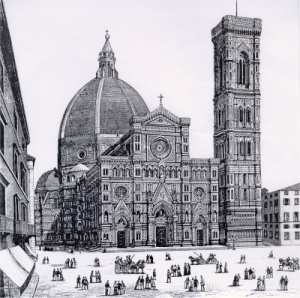 The last part of Santa Maria del Fiore to be finished was the facade, done between 1871 and 1887 to Emilio De Fabris' design, in a neo-gothic style reminiscent of the gothic decoration of the Bell Tower and side portals of the Cathedral. Like Arnolfo's facade before it, this modem front honors the Mother of Christ: above the central portal is a figure of Mary Enthroned holding a flowered scepter, by Tito Sarrocchi. But the 19th-century program is largely historical and patriotic in character; the mosaics, designed by Niccolò Barabino, represent: over the middle door, Christ enthroned between Mary and Saint John the Baptist, with Florentine saints; over the south door (viewer's right), Florentine artisans, merchants and humanists paying homage to the Faith; and, above the north portal (viewer's left), Charity among the founders of Florentine philanthropic institutions.